Robert N. Essick, professor emeritus of English, UC Riverside, has been a contributor to Blake for forty years. Mark Crosby (m.crosby@qub.ac.uk) is the Leverhulme Early Career Fellow at Queen’s University Belfast. He has just completed a monograph on Blake and patronage and is in the early stages of a research project on Blake’s apprenticeship. Morton D. Paley’s (mpaley@berkeley.edu) most recent book is Samuel Taylor Coleridge and the Fine Arts, published by Oxford University Press in 2008. 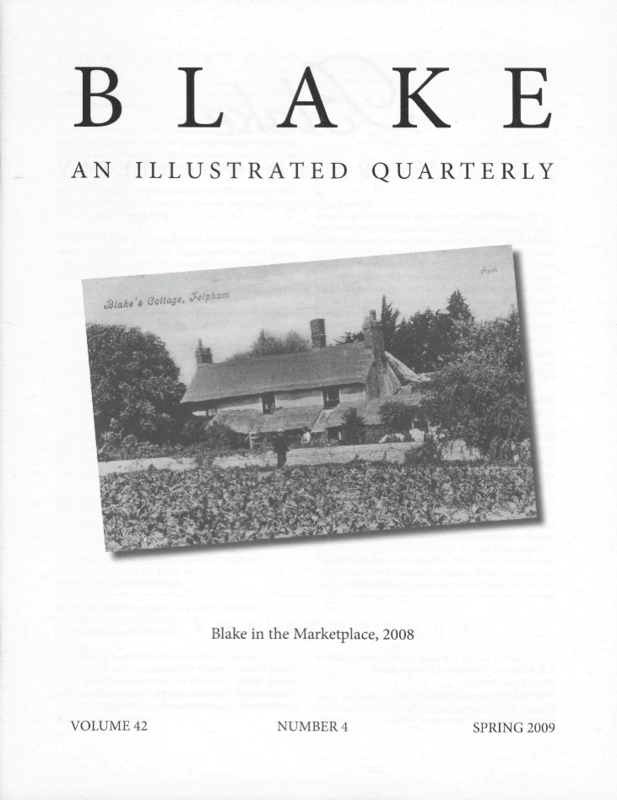 G. E. Bentley, Jr., has just published William Blake’s Conversations (Edwin Mellen Press, December 2008), with a concordance which significantly expands the record of Blake’s language in his writings. Cover: Postcard photograph, 8.8 × 13.7 cm., showing the south aspect of Blake’s cottage in Felpham (see p. 131). Essick collection.